Not your usual chili...this one combines lots of healthy ingredients for a delicious kettle of "green" comfort food! Ok. Don't pass judgement on this one too quickly! It really is a great recipe. So what if it isn't "red" or whatever color chili is supposed to be? 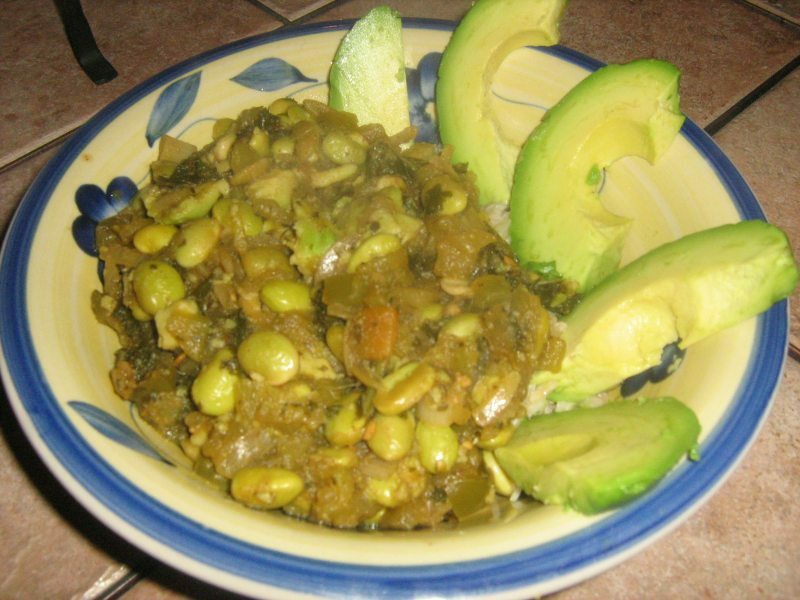 This green chili recipe is not only a great "comfort food" for those chilly evenings but it is a nutritional powerhouse as well! We substituted edamame for the "ususal suspects" in the bean department. Then we added chopped kale as an additional green power shot! Edamame is rich in protein, dietary fiber, omega-3 fatty acids and micronutrients, particularly folic acid, manganese and vitamin K. Kale is very high in beta carotene, vitamin K, vitamin C, lutein, zeaxanthin, and reasonably rich in calcium. So, you really can't go wrong with this version of a classic favorite! Try the green vegetarian chili! C'mon - you know you want to! Heat the oil over medium-low heat in a large saucepan or stew pot. Add the onion and cook for about 5 minutes or until tender. Add the green bell pepper and cook 5 minutes or until tender. Add the vegetable broth, cumin, chili powder, white pepper and cilantro. Mix thoroughly and add the green chilis, kale and edamame. Cook for about 5 minutes then add the salsa verde. Mix thoroughly, cover and cook for about 10 minutes. Add the chopped avocado and allow to cook another 5 minutes. Garnish with slices of the remaining avocado. Serve over brown rice with a side of refried beans and tortilla chips.